These cool new Edible Eyes give any fruit, vegetable or other tasty snack an instant personality. 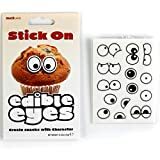 These fun stick on cartoon eyes are completely edible, come in ten different expressions per pack, and are sure to make you feel a bit guilty after taking a bite. I'm not sure if these are super cute, hilarious, or a bit disturbing... maybe all three?